One of the most popular natural casing type is the hog casing. The casings are traded at the sales unit Hank (91m) either salted, prepared for filling or on soft tubes. 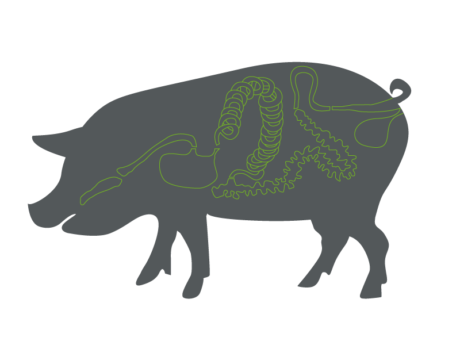 The use of the varied hog casings ranges from boiling sausages to raw sausages. For many customers, the rustic look of the fat end is, beside the taste of the sausage, a quality characteristic for high value products. Fat ends have a strong texture and low permeability. Therefore, they are ideal for the manufacture of boiling sausage products such as liver sausage. Raw sausage filled into fat ends develop a special aroma due to a long maturing period. Because of their straight form and traditional look, hog bungs are popular casings for raw sausages. The renunciation of calibration gives the product an originality which is particularly appreciated in the Iberian Peninsula and Italy. Hog bungs ends are usually traded in bunches of 9m each. For the production of laminated hog casings (also: VASCO), the natural casing is cut open and applied flatly onto a form according to the required caliber. During a subsequent heating process, protein found inside the casings will emerge. Due to the coagulation effect, individual parts are combined to create a consistent and appealing surface. Classic products covered in VASCO-casing are, for example, the Hessian raw sausage specialities Ahlewurst or Feldkieker. Among natural casings, sheep casings have the narrowest caliber for particularly thin sausages. These casings combine tenderness with a strong texture and therefore allow an ideal handling in the production process. Depending on the country of origin, the colour varies from white to grey. Well known countries of origin are, for example, Turkey, China, Australia and New Zealand. DIF use intestines as supplement for the processing of casings for the production of sausages as so-called by-products from the slaughter process. Parts of these intestines provide raw materials for special medication such as pancreatin and heparin. In order to ensure an ideal use of the resource, other products are marketed as delicacies, mainly for the Asian market, after a quality orientated refinement in our company. Throughout the decades, DIF Organveredlung Gerhard Küpers GmbH & Co. KG has become a specialist for natural casings, and the company has taken a leading role on the global market. We place great emphasis on the quality of our products during the process of refinement. In spite of modern automation, our qualified employees still continue to implement individual manual production steps. Therefore, constant internal and external monitoring is essential for quality assurance. Due to the chilled storage area and quick freeze, our production facility, which is attached to a large refrigerated warehouse, offers ideal conditions for a smooth production process. Close and co-operative partnerships with customers and suppliers and the proximity to the market have allowed us to continue to expand our range of product and services while maintaining the quality. After decades of experience and with the prospects of our company group, we still respond flexibly to changes in the market.